The weekend just past saw the local reenactment of Waterloo to mark the 200th anniversary of the battle. More on this event in another post. The occasion – and all the frantic painting happening around him – did spur/shame von Peter himself to some activity with his brushes. The planned shot up firing line landwehr battalion was several figures too far as prolonged sitting is not overly comfortable for the still recuperating post his operation von Peter himself. But there was the partially painted Prussian 12 pdr Battery Nr.4: Kapt Meyer that could be completed. And the order of battle for von Peter’s command in the Waterloo game certainly called for such a heavy battery. Work on this battery was started well before The family left on it’s world tour back in early 2009. It had been packed away with the rest of the household goods and moved into storage. Upon the return it was moved out of storage but the figures, cannons etc remained wrapped up unseen and unloved until a few days before the refight. Painting techniques mutate over the years but the executive decision was made that nothing that was already painted would be repainted. There was not the time to lavish on such luxuries. Completing the painting was not a major problem. The basing was a different story. What is normally a staged process over several nights so that the latest ‘bit’ can completely dry before the next ‘bit’ is commenced was a no starter. Basing to be completed in one night! Fortunately the wood burner was burning wood and the stands could spend periods of time sitting on the cooler outer skin for some accelerated drying. Mission completed at 1:30 am on the first day of the refight. Hurrah! Prussian 12 pdr Battery Nr.4: Kapt Meyer is now available for ongoing gaming. 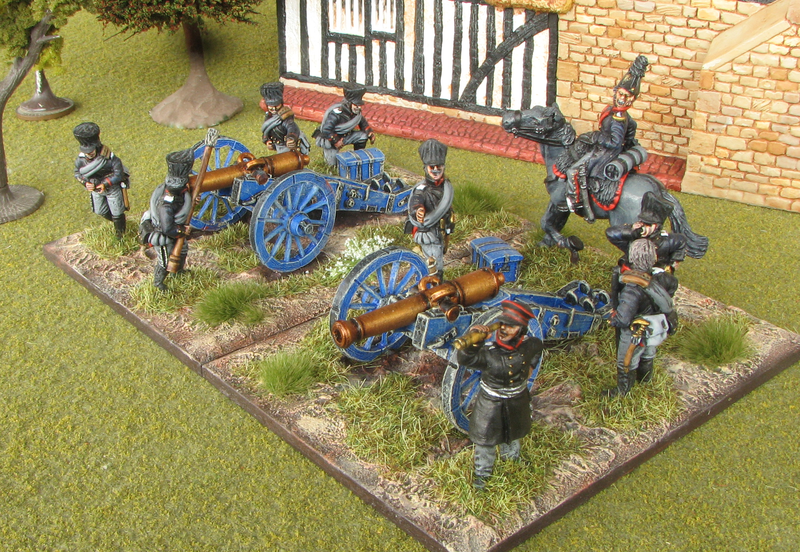 Prussian 12 pdr Battery Nr.4 was selected because it was part of the Artillery Reserve in Generallieutenant Bülow’s Prussian 3rd Army Corps in 1813 – the same corps as the 3rd Brigade which von Peter himself is modelling. Administratively 12 pdr battery Nr.4 was part of the Prussian Artillery Brigade and as such wore white shoulder straps in 1813. 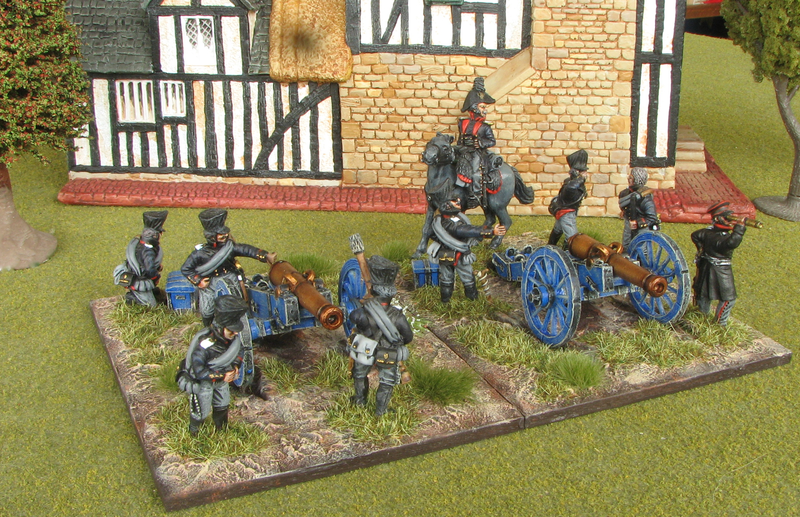 The figures and cannon are sourced from Calpe Miniatures. The mounted figures is PCU1, Regimental officer wearing bicorn and open Uberock from the Prussian Line Uhlans Advancing range. The idea is that the uhlan officer has just arrived on the scene with an urgent message for the battery commander who is currently concentrating on what is to be seen through his telescope. The uhlan officer and several of the gun crew are trying to gain the battery commander’s attention but sadly this gentleman has been around 12 pounder guns too long with the result that he is a little hard of hearing! The dear reader may see the scene a little differently in which case all power to their imagination. Don’t be forgetting to click on the two images above of the battery to see larger and clearer versions of the images. 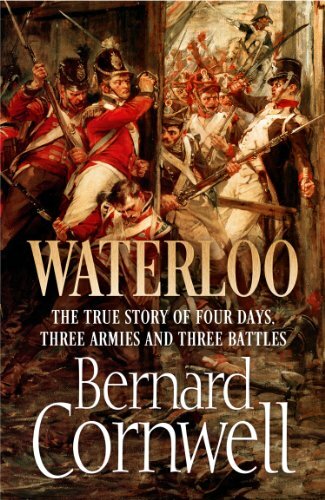 More an individual audio file than a series of audio files podcast but if the dear reader so desires they can listen to nine and a half minutes of Bernard Cornwell talking about the battle of Waterloo and his book “Waterloo: The History of Four Days, Three Armies, and Three Battles” on the same. Just head on over here and start the audio near the top of the page. If nothing else the dear reader will know what Bernard’s voice sounds like! Front Rank Figurines have a special deal for orders placed between the 13th and 30th June. For every £10.00 you spend on goods, before S&H is added you can choose 1 individual 28mm figure (value £1.20) FREE. 28mm Russian Napoleonic Guard Reinforcement packs are nearly ready. Look out for our next newsletter! This entry was posted in 06. Napoleonics, Calpe Miniatures, Front Rank Figurines, Podcasts, Prussians by von Peter himself. Bookmark the permalink. Looking real good vP. I really love the faded corlours on the guns, especially th painted ironwork! They’ll need to wait a little longer to fire their first shot in anger.